Social media is a great place to grow your network. Plain and simple. It doesn’t get any easier to find, build and nurture a group of fans, followers, and future clients, but it does take some work. Today I want to share some quick ideas on how to build relationships online before you need them. Imagine if when you send people to your LinkedIn page to check your recommendations, imagine there are months and years worth? Not just 3 you wrangled up so there would be SOMETHING there? How to build relationships online before you need them. Prevention is worth a pound of cure as they say, and the same goes for building your business. While social media may feel like an instant gratification game: read this post, tweet this idea, tag a friend, ask a question and get an answer, it really is not and as a business owner and entrepreneur you must play the social media long game. All of these changes can bring awesome growth and expansion to your business, but in order to do that successfully you must start building the foundation of these ideas today so you are ready to act on the opportunities as they come your way. Want more clients in a particular market? Join the Chamber of Commerce and get the member list. Connect with these members on LinkedIn, Twitter, Facebook. Tag/mention them in posts and create a Twitter list so you can follow and share their stuff. Create a reminder of how you know them, and what you know about them on LinkedIn. Engage with them via the social platform they seem to prefer. Finally, head to a meeting! You are now armed with great information and a foundation of connection. These members will remember you from your social media efforts and feel like they know you already. This is a HUGE step toward building a relationship before you need it. Want to expand your repertoire into speaking gigs? Research events via LinkedIn, Twitter, Facebook. Follow/Connect with the organizers and join the event groups. Add them to your Twitter lists, tag them on LinkedIn and engage with their posts! Strike up a conversation about the event, what they do, and what they need. Soon you will have paved the way for an easy “Hey I’d love to speak at your event if you have the need,” or an even easier: “Why yes, I thought you’d never ask.”, conversation in the future. Know you want to launch a new product or service? Start asking questions on Twitter, LinkedIn, and Facebook – research your ideal customer’s pain points and what your service can solve best. Test out certain marketing ideas, names, logos. Connect and follow those in your niche market. Create a list of influencers who would be interested. Engage, share and comment on their stuff! Answer questions and solve their problems before you create your product so they trust you and what you sell. Soon you will have built a nice sized group of people ready and willing to beta-test, endorse, and even buy your new product or service when you are ready to launch. Want to take on a business partner to help you grow? Research your connections list, find 3-5 people who could partner with you on a new idea, service or product offering. Create a separate private Twitter list of these people to follow, comment and engage with. Engage with them on all networks. Start the conversation with a compliment and a simple question. Keep an open mind and stay in contact, a no today definitely does not mean a no tomorrow nor 6 months in the future. You are building the relationship you will want to have down the line, and that takes time. Be consistent, thoughtful and authentic when building a relationship online just as you would building one offline and just like everything else in business it can take time and patience. But when you build before you need, when the time comes for magic to strike everything seems to fall into place. So, my fellow business owner, prepare prepare prepare so when opportunity comes your way you are ready to grab it and find your business luck! Need some more inspiration on how to build relationships? 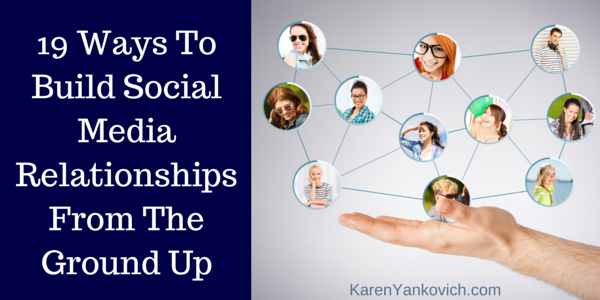 Looking for step-by-step relationship building ideas for a specific social media platform? Join me in my LinkedIn group where I can answer these questions and more!